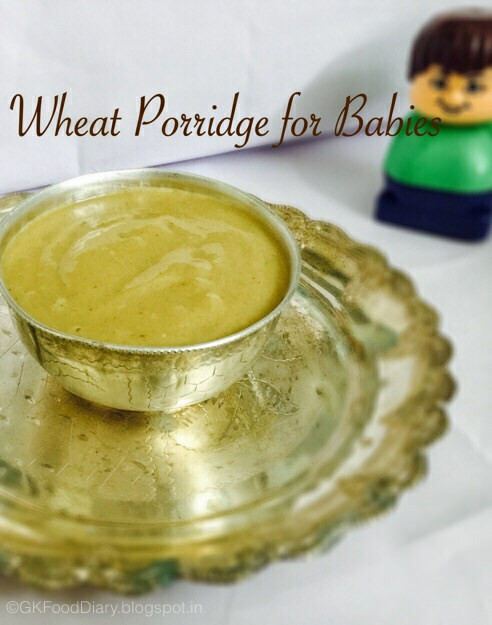 Healthy wheat porridge for babies with wheat flour, moong dal, and almonds. Firstly, we need to prepare the wheat mix powder to make the porridge. Measure wheat flour, moong dal and almonds in a measuring cup and keep everything ready. Then heat a pan and dry roast the almonds for five minutes in low, medium flame or until it changes its color here and there. Remove roasted almonds from the pan and transfer to a blender. Let it cool down for some time. Then wash the moong dal thoroughly in running water and dry it under the sun for 30 minutes or you can directly start roasting in a pan. Add moong dal in the same pan and dry roast it until it changed to a golden brown. It may take five minutes. Remove the roasted moong dal from the pan and add it to the blender. Once almonds and moong dal are cooled down, grind it together in the blender to a smooth powder. Then sieve it with a sieve and collect the sieved powder in a big plate. Now Dry roast the wheat flour for five minutes in low, medium flame for 5 minutes or until nice aroma comes. Then switch off the flame and add the ground moong dal almond powder to the roasted wheat flour and mix it well. Once done, cool it down and store it in an airtight container. Next step is to make porridge with the wheat mix powder. Take 2 tbsp of wheat mix powder in a saucepan. Add ¼ cup of water to the powdered jaggery and boil it in a separate vessel until it melts completely. Then filter out the jaggery water using a strainer in the saucepan with wheat flour mix added. Add ¼ cup of water to the wheat flour with jaggery and mix everything slowly with a whisk. Make sure that there are no lumps formed. Cook the wheat flour in medium flame until everything cooked thoroughly. Stir it continuously while cooking otherwise porridge may stick to the vessel. Add milk now to the cooked porridge. (Skip adding milk if you are preparing this porridge for a baby under one year ). Boil the porridge until it becomes thick. Remove from flame once done and cool it down. The porridge becomes thick after cooling down. So switch off the flame accordingly.